Bismarck is the Capital of North Dakota, and was founded in 1872, and is the county seat of Burleigh County, North Dakota. 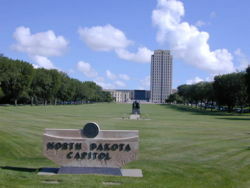 It is the second most populous city after Fargo, with a population as of July 2007 of 59,503. Population change since 2000: +5.5%. This page was last modified on 27 June 2016, at 01:10.